This Italian recipe brings the classic rustic flavors straight to your kitchen! Using paper towel, remove skin from chicken. In a large skillet over medium high heat, heat oil until hot. Sear chicken pieces on each side for approx. 2-3 minutes each. Place chicken in a single layer in a large baking dish or disposable foil tray. Reduce skillet heat to medium and add garlic and onion. Sauté a few minutes until onions begin to soften. Add pepper and sauté another 3 to 5 minutes until peppers begin to soften. Add stock and simmer veggies for 5 to 7 minutes until liquid is reduced by half. Add tomatoes, oregano, and vinegar. Stir to combine. Pour veggie mixture over chicken and bake in 350-degree oven for approximately 30 minutes or until chicken is cooked through to 165 degrees. 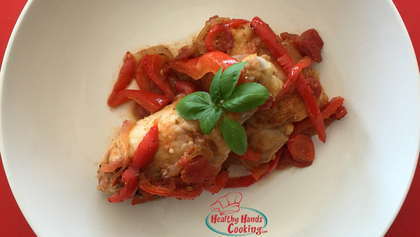 Serve chicken on a platter over cooked spaghetti squash, pasta, rice, or toasted crusty bread.